The city of Riverside is suing the state to avoid a steep water conservation requirement. What message does this send to its residents? In May, when the city of Riverside was ordered by the state to reduce its water consumption by 28 percent, it didn’t drop everything and roll out fancy new conservation programs. Instead, it went to court. Only three weeks after the State Water Resources Control Board imposed conservation mandates on water agencies across California, city leaders in Riverside initiated a lawsuit. The suit, still pending in Superior Court in Fresno County, demands that the state board withdraw the 28 percent requirement and instead impose the minimum conservation target of just 4 percent. It was a bold act, especially at a time when state officials are trying to rally everyone in California to survive the worst drought in state history. But it made clear just how difficult that team-building is going to be. Riverside wasn’t the only community to object to the rules. Many others complained. But Riverside was the only water provider that called in the lawyers. Clearly, a certain anarchy exists among some of the state’s local water agencies. Some have a reflex to protect their own fiefdoms before lending a hand with the burdens of the state at large, said Ken Baerenklau, a professor of environmental economics and policy at the University of California, Riverside. The case poses real problems for California, he said. If state leaders can’t herd all of California’s water agencies into line on simple water conservation measures, it will be unable to prevent a catastrophe as the drought worsens. Riverside officials say they asked for an exemption before and during the May proceeding, but were “ignored,” according to the lawsuit. Riverside considers itself “truly water independent” and, therefore, argues that it should not be subject to a 28 percent conservation. The city of 320,000 has spent millions developing a groundwater aquifer that has enough reserve to meet all the city’s needs for four years, said city spokeswoman Heather Raymond. Also, Riverside does not rely on water imported from elsewhere. The case poses tricky choices for the state. If it grants Riverside an exemption, should the state consider exemptions for other water agencies? What criteria should be used to evaluate such requests, and does the water board even have time to evaluate them? 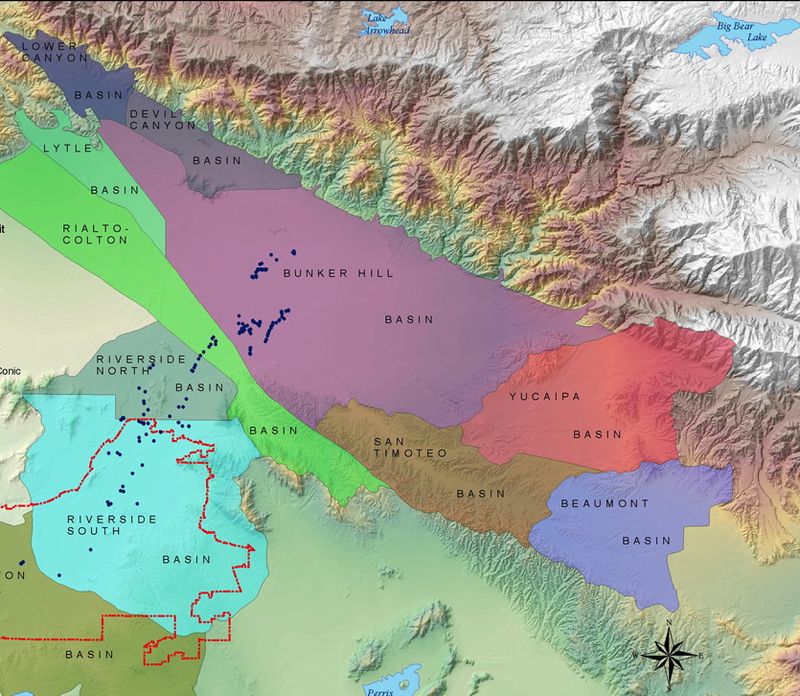 A map of groundwater basins in the Riverside area. The city limits are shown in red on the lower left. The Bunker Hill Basin (shown in purple) is the primary source of the city’s water currently. Another key question: Does it matter if Riverside or any other city is “water independent?” If it ran out of water, the state and neighboring communities would surely step up to keep Riverside hydrated if the drought continued. So the more water Riverside can conserve, the longer that risk is forestalled. In Riverside’s case, a crucial factor is that the city has a plumbing connection to imported water. The city has a pipeline link to the Metropolitan Water District of Southern California, which imports water from the Colorado River and the Sacramento-San Joaquin Delta. The John W. North Water Treatment Plant in Riverside provides millions of gallons of water for Riverside Public Utilities’ customers each year and helps the City of Riverside remain water independent. So, theoretically, if Riverside received an exemption to the conservation requirement, and then depleted its groundwater sooner than expected, it could suddenly become totally reliant on someone else’s water. It would become yet another straw slurping imported water that other cities rely upon – cities that readily complied with the state’s conservation rules. Tracy Quinn, a water conservation expert at the Natural Resources Defense Council, said this is reason enough to hold firm on the conservation rules. Raymond said the city has no plans to use that connection to imported water supplies. Riverside is not immune to the drought. It relies largely on the Bunker Hill groundwater basin, a large aquifer north of the city. One year ago, the San Bernardino Valley Municipal Water District, which also relies on the basin, reported that water levels had reached the lowest level in more than 50 years of record keeping. During June, Riverside residents consumed about 125 gallons of water per person each day. That’s about 25 percent more than the state average, which came in at 98 gallons per person in the first month after the water board imposed the mandates. Riverside residents also missed their 28 percent conservation target in June. They managed just 22 percent. This poses an obvious question. Did the city’s lawsuit against the state send a message to residents that water conservation in Riverside is not important?